The Faculty of Environmental Science and Engineering is one of the most dynamic and modern faculty of Babeş-Bolyai University. Teaching young students about environmental problems –bachelor, master and doctoral levels – is performed in the newest and most desired specializations, benefiting of the most modern studying conditions, due to our laboratories which are equipped with recently acquired state-of-the-art analytical equipment. During studies, the offered courses aim both at providing knowledge, to a very high-professional level, for the basic disciplines, and for some groups of subjects – provided by optional courses – giving each student the possibility to personalize the chosen specialization. The theoretical knowledge is backed up by various fieldworks. The research activity is sustained besides the existing laboratories, by the Research Institute for Sustainability and Disaster Management based on High Performance Computing (ISUMADECIP) that provides the framework for interdisciplinary research, setting the basis for addressing the prevention and response to disasters, in accordance with the specific national requirements, but also with the concepts promoted by NATO and the European Union. The MSc portfolio programmes has recently been reviewed and updated according to the market demands, so as to make sure that student learning outcomes are relevant to the future employers. We are confident that we offer suitable and attractive MSc programmes in the fields of Environmental Science and Environmental Engineering. The MSc in Environmental Management and Protection – EMP (in the field of Environmental Science) is a 2-year full time programme taught in Romanian. This Master’s program aims to train experts in environmental management and protection for various socio-economic domains (e.g., mining, industry, water management, and infrastructure). The main topic of this specialization focuses on acquiring knowledge about various types of pressures and impacts generated by human activities on environment, society, and economy. The program offers, in particular, the opportunity for students to learn and apply various scientific methods and techniques as tools for: identifying the different types of pressures and impacts on environmental factors; implementing measures/actions/plans in order to mitigate the negative and long-term consequences on the society, economy and environment; operating and implementing the principles and procedures of environmental management systems; implementing environmental planning and decision making at organizational, local and regional level. Study programme includes: Environmental Impact Assessment Methods and Techniques; Energy and Environmental Resources; Water Resources Administration; Global Climate Change; Management of Risks and Disasters; Human Health Risk Factors; Degraded Lands Rehabilitation; Environmental Pollution Prevention in Industry; Legal Instruments of Environmental Protection at International Level; Applied Geospatial Analysis; Fieldwork; Meteorological and Hydrological Hazards; Strategies in Biodiversity Conservation; Environmental Management Systems; Impact of Valuing of Mineral Resources on the Environment; Ecological Restoration; Quality Assessment and Soil Protection; Regional Planning and Local Development; Waste Management Methods and Techniques. The master programme of Risk Assessment and Environmental Security – RAES is a 2year full-time programme (taught in Romanian) in the field of Environmental Science. This MSc allows students to acquire knowledge on several types of threats and risks in the environment, during normal activities and emergency situations. The program offers the possibility for students to learn and to apply risk analysis as a tool for: identification of risks and possible intervention actions; implementation of risk reduction methods through prevention actions or mitigation of negative consequences on the population and the environment; elaboration and use of management systems within the field of safety, health and environment. Study programme includes: Risk and technologic disasters management; Risk assessment and management of hazardous chemical substances; Natural disasters and risks management; Risk assessment: water and soil; Environmental projects management; Emergency situations management; Information technology in risk assessment; Human health risk factors; Environmental pollution prevention in industry; Toxic and dangerous waste management; Professional practice; Contaminated sites management; Methods and techniques for environmental impact assessment; Environmental risk communication; Principles of industrial hygiene and safety; Fire and explosion risk assessment; Communication techniques and principles of academic writing; Environmental impact of mineral resources exploitation; Emergency medicine; Dangerous goods transport risks; Legal instruments of environmental protection at international level; Applied remote sensing; Acquisition and interpretation of environmental data. The MSc in Environmental Quality and Energy Sources – EQES (in the field of Environmental Science) is a 2year full-time programme taught in Romanian. This Master’s programme aims to train future professionals in the large field of environmental monitoring and protection, who will be able (on the basis of the integrated, systemic view on all approached environmental topics) to apply the acquired knowledge and expertise in solving a wide range of concrete problems encountered in real life. Apart of protection of the environment, population and infrastructure, protection is also strongly envisaged. The EQES master programme provides quality knowledge related to the following subdomains: (a) detection and quantification of chemical pollutants at trace levels, including dangerous and highly toxic chemicals, using various modern methods of physico-chemical analysis and separation techniques; (b) measurement of physical pollutants, such as noise and electromagnetic fields; (c) radioactivity, radioprotection, radon determination and dating techniques; (d) energy sources, with emphasis onto renewable energies. Study programme includes: Sensors in control and prevention of environmental risks; Energetic resources and environment; Radiations and radioisotopes. Dosimetry and radioprotection; Modern techniques in trace and ultra-trace detection of chemicals; Management of natural risks and disasters; Electromagnetic and noise pollution; Principles and applications of green chemistry; Dangerous chemical pollutants in the environment; Environmental biophysics; New sources of energy; Renewable energies; Professional practice; Pollution with heavy metals; Biomonitoring of trace elements; Population protection against highly toxic chemical and biological agents; Separation analysis techniques used in environmental evaluation; Indoor air quality – assessment and remediation techniques; Spectrometric methods in environmental analysis; Dating techniques and methods used in paleo-clime reconstruction: Soils quality – evaluation and protection. The master programme in Waste Management Engineering – WME provides comprehensive training in this field of waste. 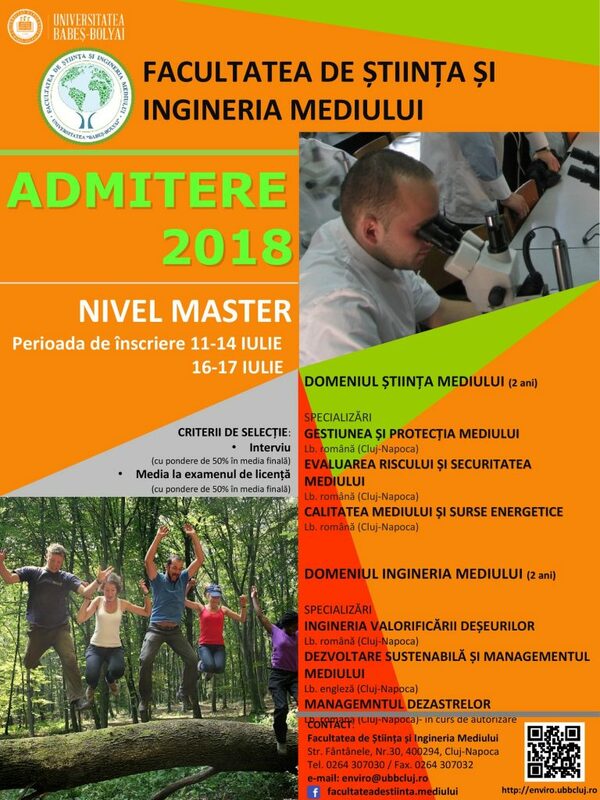 The MSc in Waste Management Engineering (in the field of Environmental Engineering) is a 2year full-time programme taught in Romanian. Students will gain and develop engineering skills and be able to design, develop and apply the concepts for waste as a resource. Consequently, the WME programme supports students to understand the innovative approaches in this field of waste and to apply them to the real-world problems. Structure and Contents of Courses: The Masters course comprises of four semesters including completion of the Master dissertation. Compulsory courses include basic instruction in the fields of Law, Computer-aided design for environmental protection and Project Management. Majors subjects: Solid waste; Management of contaminated sites; Pollution control; Recycling. Professional Perspectives: Graduates with a master degree in WME become specialists in the fields such as: disposal of solid waste, sewage plant technology, or soil protection. Waste management engineers work in the following professions: Waste disposal companies; Engineering offices; Consultancies; Water utilities, Environment authorities (regulatory bodies) and associations; Production plants; Research institutes. The MSc in Sustainable Development and Environmental Management – SDEM (in the field of Environmental Engineering) is a 2year full-time programme taught in English. This Master’s programme aims to train future change-makers and leaders who are able to understand the integrated nature of the environmental subjects and to put into practice a number of methods and techniques for environmental management, in order to develop a sustainable human society. The program provides, in particular, the opportunity for students to learn and apply: knowledge and techniques needed to develop and implement environmental policies in order to achieve sustainable development; analytical thinking that leads to environmental decisions; interactions between science, politics and policy, society, economy and environment; specific case studies for Romania and other European countries. Study programme includes: Fundamentals of sustainable development; Integrated environmental management systems; Assessment and analysis procedures in ecological management; Risk assessment and management of hazardous chemical substances; Fire and explosion risk assessment; Environmental policy-making; Global climate changes; Integrated management of water resources and wastewater treatment procedures; Integrated management of natural and technological risks; GIS analysis for environmental studies; Professional practice; Waste management, treatment and recovery; Management of contaminated sites; Green marketing and negotiation tactics; Energy resources and the environment; Computer-aided design for environmental protection; Professional practice. The MSc in Disaster Management – DM (in the field of Environmental Engineering) is a 2year full-time program, aimed at training specialists in organizing emergency interventions and in taking preventive measures for specific emergency situations. The graduate will be an engineer who will have adequate theoretical knowledge and will be able to adopt it for use in his/her practical work as and when required. He/she is able to assess risks, vulnerabilities and emergency capacities, to assess and plan costs and expense priorities, to identify rehabilitation methods following an extreme event, to manage and organize rescue actions, conduct safety and risk analysis, to investigate causes of fires, failures and accidents, to manage and solve specific environmental issues, to plan recovery and logistic activities. Practical work experience in the form of field visits and industrial visits are a key component of this curriculum. Study programme includes: Risks and disasters management, Chemistry and detection of explosives and super-toxic compounds, Natural risks and disaster management, Technologic disaster management, Monitoring of atmospheric pollutants, Emergency situations management, Disaster sociology, Human health risk factors, Fire risk management, emergency situations logistics, Legal and institutional components of disaster management, Fires and explosions risk assessment (in English), Methods and techniques for environmental impact assessment, Disaster risk communication, Basic hygiene in refugee camps, GIS and disaster management, Emergency medicine, Climate change and disaster management (in English), Risks of dangerous substances transport, Communication techniques and academic writing (in English), Response and intervention to specific emergency situations, Applied remote sensing, Acquisition and analysis of environmental data, Field work. As a graduate of any of the above presented master programmes, the students will have a wide field of employment options in the private, public and semi-public sector or she/he may choose an academic career by continuing with PhD-studies in a relevant field.